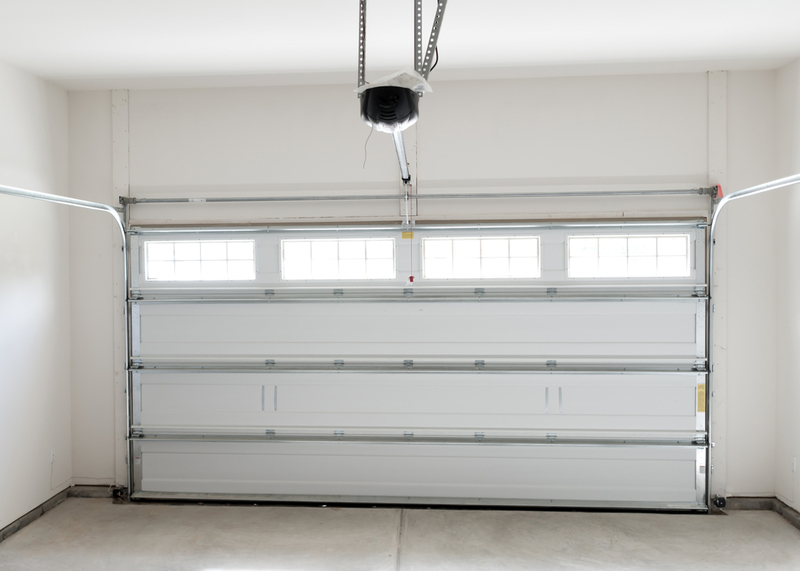 One of the most common, but annoying garage door issues is when it jumps its track. It is extremely important to cease trying to operate it when this happens. Operating it while it is off of its track can cause further damage to the garage door. This will also increase the cost of repairs. It may be necessary to contact a garage door technician; however, if it is caught soon enough and is only slight, Do It Yourselfers may be able to correct the issue. 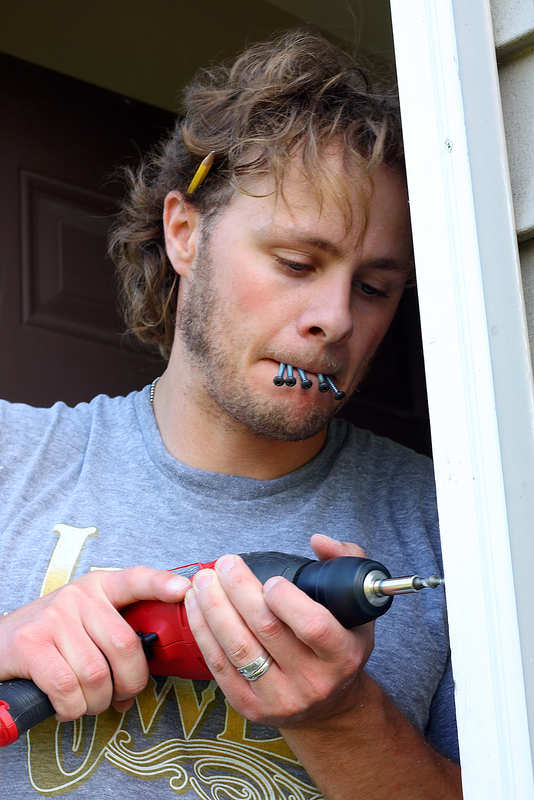 It can be a simple case of popping the roller back into place and re-affixing the garage door. 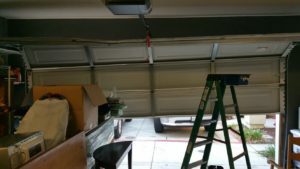 Remember that working with garage doors can present serious dangers and inexperienced individuals are wise to turn the project over to a professional. •First locate the handle and rope hanging from the midpoint of the garage door opener track. Ensure that the garage door is in the closed position. Disengage the opener from the garage door by pulling the handle. 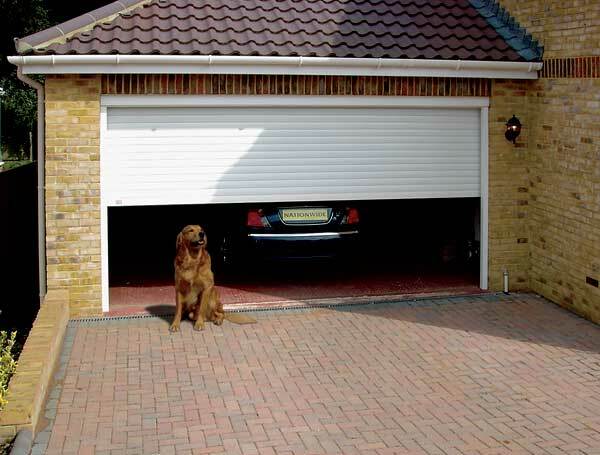 • Raise the garage door slightly until the rollers align with the area of the issue on the track. Use a clamp, a pair of locking vice grips, or pliers to secure the garage door. Place them onto the track right under the lower portion of the door. • Use another pair of pliers to open the door track in close proximity to the location at which the rollers jumped it. If the width of the track allows it, you may be able to direct the roller’s wheels back on the track. • Close the opening again using a block or plank of wood and hammer. The piece of wood should be placed against the outer edge as a buffer and try gently tapping the track to straighten it with the hammer. A carpenter’s hammer will work; however, a wooden or rubber mallet is ideal as it will not cause as much damage should you hammer too hard. • Remove the clamp, locking pliers, or vice grips. 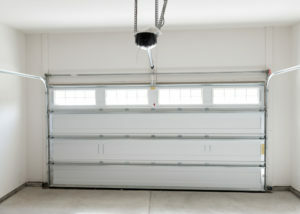 Close the garage door by lowering it completely until it is flush with the ground. Press the button on garage door opener remote to ensure it is closed. During the process the opener should snag the garage door which should then snap the release apparatus into it proper position. The garage door and it opener should now function correctly once again. • It is important to test the garage door a number of times to ensure that it is once again functioning properly. Watch carefully as the garage door continues through its operation and take note of any problem areas. Look for places at which the rollers catch or drag because you may be required to straighten the track a little more in those areas. Lack of knowledge and/or experience are not the only reasons that homeowners call on garage door specialists for repairs or maintenance. Most of these task are actually rather simple to complete. The world is extremely fast paced today and families are extremely busy with careers, academia, and extra circular activities. They simply do not have the time required to attend to these things. Our garage door technicians are highly skilled and waiting to get started on your garage door project today. 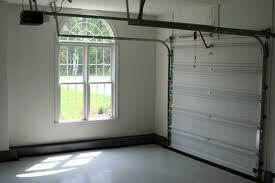 Most people use their garages to store more than just the car. In fact many families don’t keep their cars in the garage at all, but instead use the space to store just about everything else. Whether you fall into that category or not, there’s a good chance you use your garage to store items that would be attractive to the less honest members of a society. 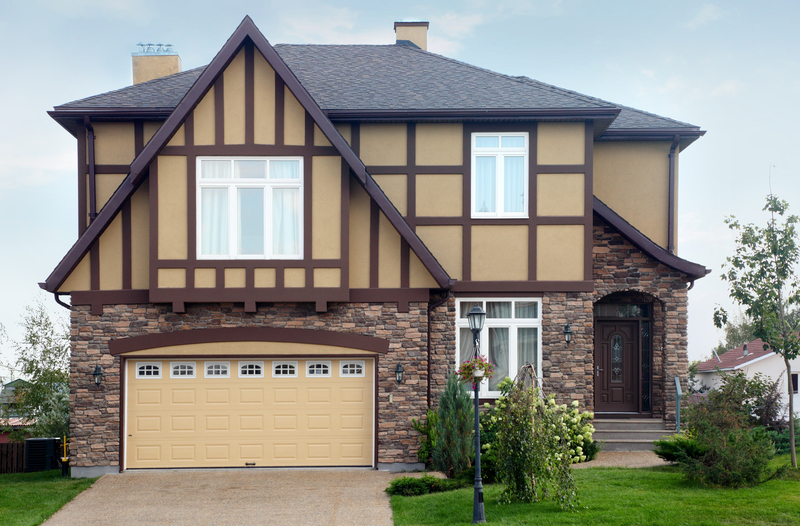 For that reason it’s important to keep your garage door in the best possible shape – Your home security depends on it. If your garage door should need some attention, to prevent it from being a weak point in your home security, you have two choices. You can work on the door yourself or you can call in the experts. Often the latter choice can be the most prudent. In fact here are three good reasons to engage a garage door repair service to resolve any problems you come across. Because garage door repair companies work with a wide range of brands, they can easily source any replacement parts necessary to repair your door. The technician will typically arrive with all the parts necessary to carry out any repair that your garage door may need. If replacements are not immediately available though, he or she is likely to source them very quickly and then return to complete the job. This saves you the trouble of hunting around hardware stores trying to find the right parts for your garage door repair. There are some garage door repairs which are just not suitable for DIY. 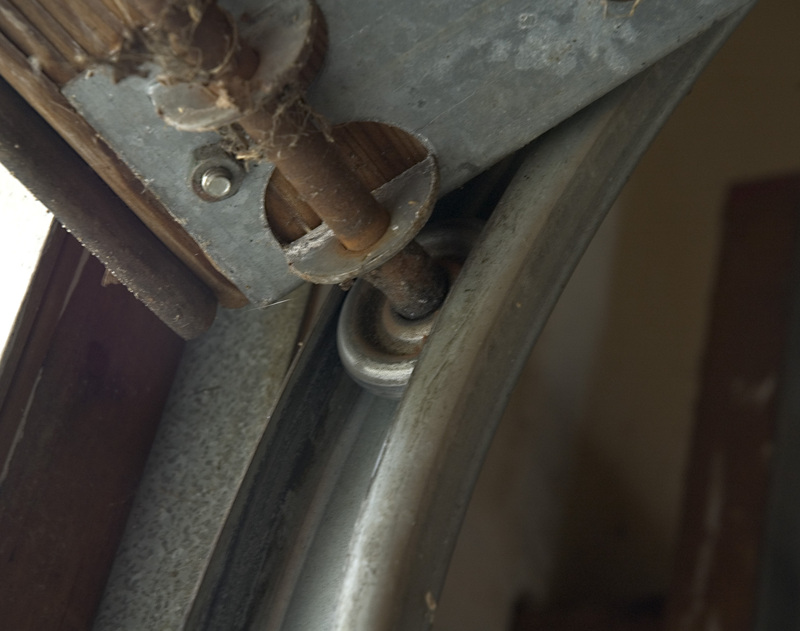 For example, if the problem is related to the door springs, or the springs must be removed to affect a repair, a professional will be able to fix the issue safely. Many people have been injured while trying to work on garage door springs, which are fitted under an incredible amount of tension. It’s really better to be safe than sorry and leave jobs like this to the experts. A technician from a reliable garage door repair provider will be able to perform any repair, whatever your garage door brand, type or style. He or she will have specialized tools and equipment, access to technical documents for all brands of door and automatic opener and a wealth of training and knowledge to employ in making sure your garage door is back to working order in no time. There are many more reasons to trust your garage door repairs to a professional company. Even if you enjoy DIY, a problem can crop up at any time and you may not be in a position to deal with it immediately. For example, trying to source parts to repair a stuck garage door in the middle of the night isn’t the easiest task. Most repair companies offer 24 hour call-out services and although it will cost you a few dollars more than a DIY job, a professional repair saves you time, effort and unnecessary inconvenience. Having a new garage door installed is a relatively inexpensive way to add curb appeal to your home, particularly if your garage is at the front of your property and can be seen from the sidewalk or the road. Even so, if you are going to spend money on a new garage door, choosing wisely will help you to ensure that you see a return on the investment you are making – In other words, your new door will pay for itself in the value it adds to your home. This short guide suggests a few things worth considering if you want to get the best ROI on your new garage door. Apart from improving the aesthetic appeal of your home, there is another way in which a new garage door can pay for itself – By delivering energy cost savings. 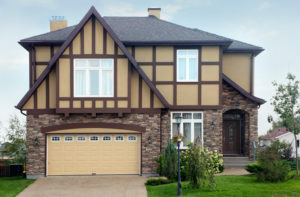 Whatever type or design you choose, ensuring your new garage door is insulated is the surest way to recoup the cost of purchase and installation. By reducing the amount of heat (or cool air if you are in a warm climate and use air conditioning) that escapes your home by way of your garage, an insulated door will make a difference, however small, to your heating energy costs. It’s surprising how often people choose a new garage door for the way it looks in photographs or in a showroom, without considering if it fits the style of their homes. For a new garage door to do your home justice and add maximum value, its style must be in keeping with the rest of your house. For example, if you have a very modern, contemporary style of home, carriage house garage doors won’t make the most suitable choice, however nice they look in themselves. Once you’ve decided upon the style of garage door which most suits your home, the hardest part of the selection process begins. Garage doors are comprised of sections which more often than not, are covered with some form of overlay to provide a certain visual effect for the door finish. The only doors which don’t have an overlay are the cheapest products made from steel. These inexpensive garage doors have a design embossed or pressed into the steel sections, typically mimicking the effect of wood grain. While a garage door with an overlay is going to be more expensive, you will be able to choose from the widest range of designs and effects, which of course is important if you are to maximize the curb appeal of your home. You can choose from overlays made from real wood, cellular PVC or wood composite materials. Real wood overlays are the most expensive, while a door with wood composite overlays can be had for little more than the price of an embossed steel door. 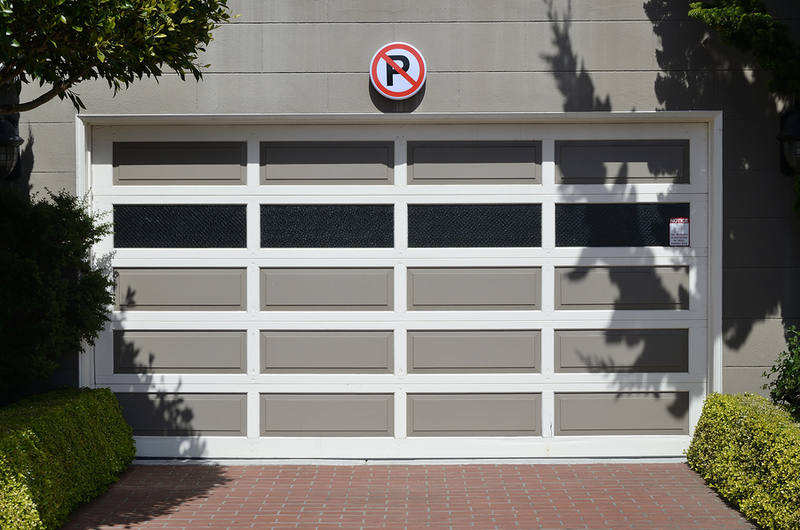 Hopefully this guide will help a little when you choose a new garage door with ROI in mind. If you select a door with a nice overlay, in a style that matches your home and with insulation built-in, you should see the payback over the door’s lifetime or within the price you receive for your home if you sell. Is it Possible to Have a Glass Garage Door? For sure you have thought about having a garage door made of glass at least once. If you did some research on the market you may have noticed that there are no offers when it comes to this product. The truth is that in theory it is possible to have an all-glass garage door, but reality begs to differ. Why aren’t there any glass garage doors? If you do research the matter you might see that the garage doors you find are sectional garage doors made of aluminum frames that come with inserts of glass or polycarbonate which give the impression of a door made of glass only. Naturally, we also have to take into consideration that there are some places where the law doesn’t allow constructors to use glass right above the heads of the people passing by. What is that you can find on the market? If you are determined to have a glass garage door, most probably you will get a sectional garage door. It is common for the manufacturers to achieve a glass-like surface by using toughened acrylic. At the moment there are two main options for you to achieve a glass door. One of the options is to use a sectional door that comes with glazing sections which make the door look like it is made of glass. The second solution is to have a trackless sectional door that has glazed panels. In order to make the door lightweight, easy to operate and modern, the majority of the manufacturers use aluminum. If you want to make sure that you have the glass door that you always wanted but you have some privacy as well, you might want the glazing to have a smoky effect. The only downside of these garage doors is that you need to place a special order for them and they are usually made only in large sizes as they use the mechanism of industrial garage doors. If this isn’t exactly what you had in mind, you might also consider the trackless sectional doors. In this case the door has a counterbalance weight system, which is able to lift the two panels vertically without using internal tracking. This solution is suitable for your home if you have a high ceiling. Usually the frame of the garage door is made of timber. The advantage of this material is that it is durable and the homeowners can choose from numerous different colors to match the style of their home. Some might have concerns regarding the glass garage doors. As it has already been mentioned, these are made of toughened materials so they offer some degree of sound and heat insulation. In order to have as much privacy as possible, it is best to choose the garage doors that come with a smoky color. Although it’s not possible to have a garage door made only of glass, there are several alternatives that look just as good and that are highly functional. Technology is making great advancements and new designs appear every day, so why is it that the side hinged garage doors are still so popular? These doors all use the same mechanism: two side hinged panels in a frame. Besides the simplicity of the mechanism, what makes them so appealing to people? All people know the side hinged doors and they know that they are easily operated. There is only one lock or handle to open and there is no need for lifting. 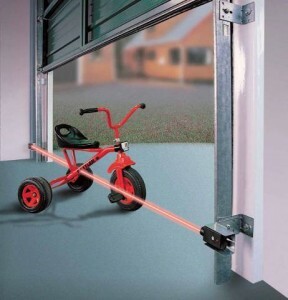 If you’re using the garage door not only to enter with your car, this might be the best solution. This is because the mechanism allows you to open the door only halfway so that you can enter by foot and then you can close it again. The majority of the designs have a 1/3 or 2/3 split and there might be a pedestrian door as well. In this case the large leaf is only opened when the garage door is fully lifted. The majority of people imagine timber when it comes to the materials. Nonetheless, there are some more practical solutions as well, such as steel and GRP. The mechanism is the same, but the design takes advantage of the more modern materials for flawless operation. One of the major disadvantages of timber is that in some cases the garage doors are made of low quality, unsorted redwood that could warp and rot. However, this isn’t the only option that homeowners have. One of the best solutions is to get a garage door made of cedar wood which is lightweight and it has a high resistance against the elements. In case you use the right treatment, you can give the door any color you’d like so that it will match the style of your home. Although it might not be the most popular material when it comes to doors, there are some high quality single skin steel garage doors made of galvanized steel. These come with all the parts included so the door is easy to install. GRP is also known as fiberglass and the advantage of these garage doors is that they come in numerous styles, designs and colors and they come with all the parts included so they can be installed fast and easy on site. These represent good value for money and the best thing about them is that they need only little maintenance. One of the biggest hits of the moment is the insulated side hinge garage door. These offer heat and sound insulation. Aside from this, they are also known for the high level of security that they offer. Some might think that the side hinge garage doors aren’t modern enough, but when it comes to functionality, they always represent a safe bet for all homeowners. Garage doors come in many different materials and styles. You can have a plain and mundane garage door, a smart and stylish steel door, faux or real wood carriage style. For a garage door that will really turn heads though, how about having one that doesn’t even look like a garage door? Did you know you can buy garage door artwork which will fool passersby and visitors into seeing something completely different? 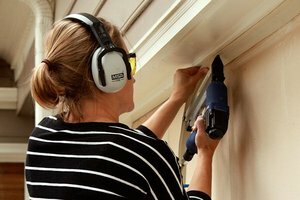 There is a growing trend in garage door decoration, which started in Europe and is beginning to take off here in the United States. Weatherproof 3D murals, made especially for garage doors can transform even the ugliest door into an amazing work of art. In fact the images are so realistic, they might not be a good idea for anyone living at the side of a busy road, for fear of causing accidents. 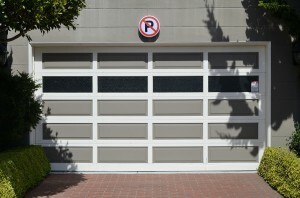 Costing anything from $200 to $500, the murals attach to the door of your garage using magnets or Velcro. Made from durable material used for commercial outdoor advertising, these amazing prints are easy to attach and remove. If you have the budget and a penchant for collecting, you could even have a range of murals to interchange whenever you fancy a change. Many of the murals make your garage look as if the door is open, with an exotic car, motorcycle, boat or even a jet fighter parked inside a stunningly realistic garage interior. Far from being limited to transportation themes though, you can fool onlookers into believing you have a giant crocodile or an elephant captive in your garage. How about a garage full of gold bullion? Just make sure you secure your garage well though as this might attract thieves, so realistic are the images. Other murals use images such as a fully-stocked wine cellar, music studio, and platform of an underground metro station complete with train. There are also beautiful cityscape and landscape images to choose from. If you have a double or even a triple garage, you can have an image in two or three parts. When each part is fitted onto a respective door, the result is an image which extends across the front of your garage to make it look as if you have a ship or jumbo jet stored in there. If you do have a mind to purchase any of these murals, be sure to check with your city first. Otherwise you may be forced to take it down, which would spoil all the fun. If your garage is in plain sight of your neighbors, it’s a good idea to canvas their opinions too. Some people just don’t want to see anything which stands out too much. The beauty of garage-door murals is their impermanency as well as their visual impact. If you are putting your home on the market, for example, you can easily take the mural down: potential buyers may not have your taste in artwork, after all. These images might not be for everyone, but if you really fancy doing something different with your garage door’s presentation, they make an unusual and fascinating focal point in the approach to your home. If you have a painted steel garage door you may, at some point find the paint starts to peel from the surface. Unlike wooden surfaces, steel doesn’t accept paint readily and if the wrong type of paint was used, or the garage door surface wasn’t prepared sufficiently, the paint can eventually lose adherence. However, although unsightly, it’s not the end of the world and you can easily patch up your paintwork and have the door looking attractive again. Step 1: Use your metal putty knife to scrape all peeling, bubbling or chipped paint from the surface of the door. Step 2: Use the sandpaper to roughen up the bare door surface in the areas where you scraped the paint away. Step 3: Using a solution of two gallons of warm water with 1/3 of a cup of trisodium phosphate added, wash the door down with the sponge. This is where you need to have the rubber gloves on, to protect them from the soap solution. Step 4: Rinse the door down using the garden hose. Step 5: Use your clean, dry cloth to wipe all moisture from the bare areas of the door. Step 6: Coat the bare areas of the door with the steel primer. Give the primer at least a couple of hours to dry before continuing with the next step. Step 7: Finally, paint the entire garage door with a coat of acrylic-latex exterior paint, using the roller and tray. Before you carry out step 7, it can be a good idea to test the exterior paint on a small section of the door. Just use your paint brush to apply a small square of paint. Leave it to dry for a couple of hours and then stick a strip of masking tape to the test square and peel it off again immediately. Take a look on the paint can to find the temperature range recommended for applying the paint. If the actual air temperature is outside of the stated range, wait until the temperature is correct and test once more. If the paint comes away a second time when you apply tape to it, you should probably get some advice from the store where you bought the paint. By following the seven steps above, you can soon have your peeling steel door looking great again and adding to the curb appeal your home deserves.